Common Core math testing – oh dear! You should all read this, from the Washington Post October 2013. “Why are some kids crying when they do homework these days? Here’s why, from award-winning Principal Carol Burris of South Side High School in New York”. “Is” is a very overworked word, to the point of illogicality. Technically in both cases none of them. In everyday language we can get away with the question and accept the answer “The first one” even though it is actually a picture of the head of a dog. 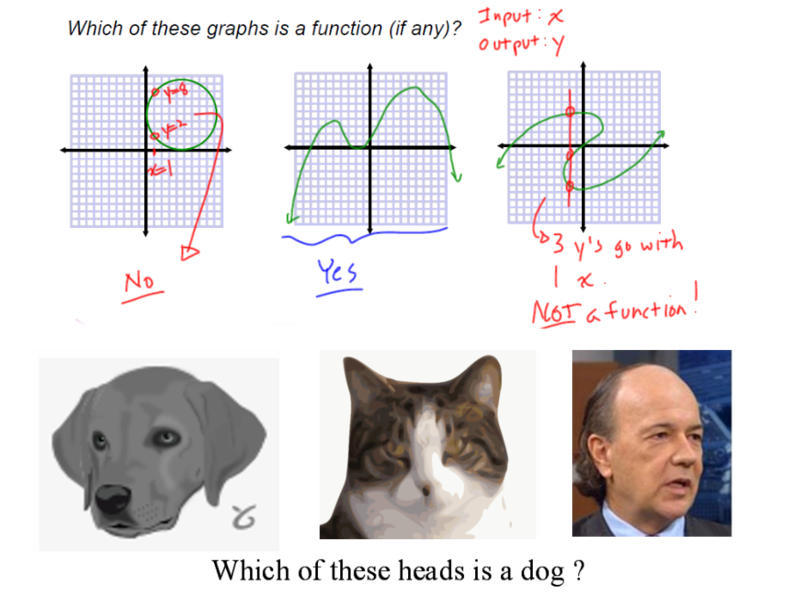 In math we MUST be more precise, and ask “Which of these graphs is the graph of a function?”, or “Which of these graphs could represent a function?”. consisting of an input and the corresponding output. But at least WE all know what a graph is…..or do we? CCSS and Standardized Testing – Who shall pass and who shall fail ? by Anthony Cody, and you should read it. The Department of Education in New York convened a panel of educators to set cut scores on the new Pearson Common Core-aligned tests. This article http://www.lohud.com/story/news/education/2014/07/26/common-core-cut-scores-examined/13219981/ spilled the beans about the process. Tina Good, coordinator of the Writing Center at Suffolk County Community College, said her group produced the best possible cut scores for ELA tests in grades 3 to 6 — playing by the rules they were given. The result was that this panel of professional educators provided the state of New York with the cut scores that meant only about 30% of the state’s students were ranked proficient. If you want to know more about Euclid and his influence, especially outside mathematics, read this. It is fascinating. Pythagoras, triples, 3,4,5, a calculator. 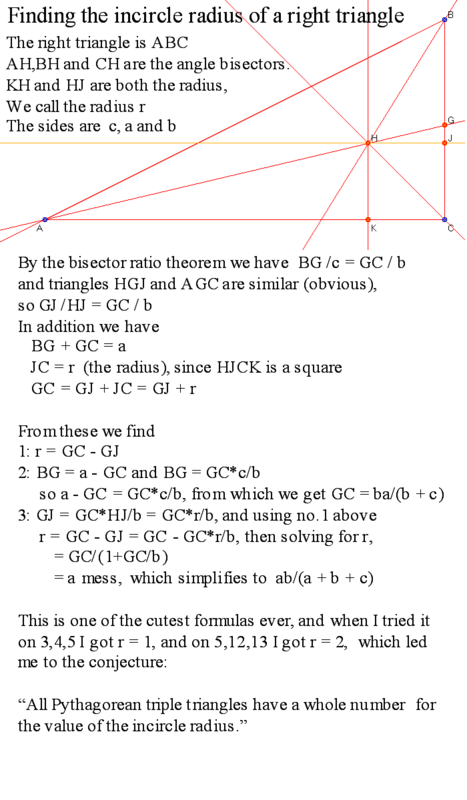 How to generate Pythagorean triples (example: 3,4,5), well one way at least. and if we write x = A2 and y = B2 the right hand side is a square as well. Conjecture1: This process generates ALL the Pythagorean triples. Conjecture2: Every odd number belongs to some Pythagorean triple. My next post will be about finding the radius of the inscribed circle in a right angled triangle…..